Sorry for the delay in posts. I think my professors had a personal vendetta against me writing this blog. I mean, there is no other way to explain why they would give me so many projects and reading to work on (well, besides the fact I am in Grad school, but still). Anyway, I’m going to make a concentrated effort to post a little more regularly. We’ll see how it goes. and here’s your tip for this post, sent in by a long time friend of the blog (thanks Mom). Besides my iPad, my favorite tech device currently is my 3rd Generation Kindle . If you like reading and haven’t looked at an e-reader, you should check them out. Thanks to Amazon’s now Ad-supported version, you can pick up one brand new for $114. I’ve tested it out and the ads display when the reader is off (kinda oxymoronical, but it works since the Kindle is never technically “off”, just “napping”), as well as in the bottom of the menu screen, but never while your reading. (if that’s too much for you, just pay the $25 more and get the ad-free version). And if the $114 is out of your price range, well, you can get the reader program for your Mac, PC, iPhone, iPod Touch, iPad, or Android device. Needless to say, if you can read this post, then you have a device that can read kindle books. The reason I suggest looking into it so strongly, is because the wealth of books out there, that can be purchased for free or very inexpensive. Even if you don’t plan on purchasing a kindle soon, you can amass a large library and those books will stay in your collection for as long as Amazon is in business (in other words, a VERY long time). No, I won’t post updates every time a new free book is up, but I’ll provide you with a few links to get you started. Do you have any other good kindle book resources to share? 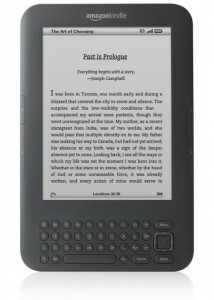 What do you like/dislike about current E-readers? Let me know in the comments.